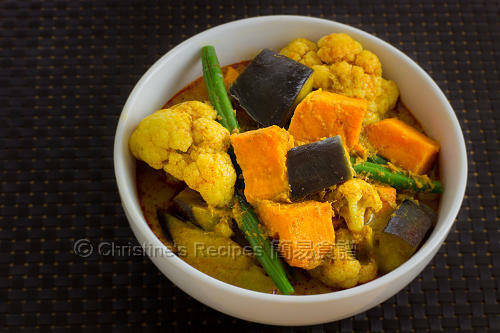 This Malaysian curry dish is one of my favourite meatless meals. If you’re looking for some easy or quick dinner ideas, this recipe is a good choice. This dish tastes a bit spicy and hot, good for warming up our body in cold weather, or increasing our appetite on hot days. 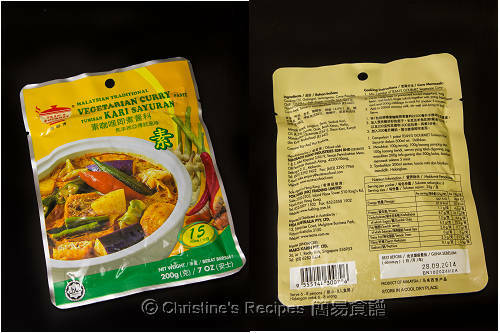 The Malaysian curry paste I used was store-bought. It tastes really authentic. You don’t need to add any spices yourself. Best still, the curry paste is very versatile. You can add any vegetables you’ve got, or add any meat you like. This recipe is so easy to make on the go. Mix 2 teaspoons of oil with the sweet potato. In a microwave oven, cook on medium-high heat for about 10 minutes. If a sharp knife can easily poke in, it’s done. Combine the curry paste, water and stock well. Pour into a large pot. Bring it to a boil. In the meantime, blanch the cauliflower and green beans in boiling water for 3 to 4 minutes. Drain up and rinse with cold water. Set aside. When the curry sauce boils, add the egg plant, sweet potato and cauliflower. Cook for about 5 minutes. Then add the green beans. Pour in the coconut and combine well. Bring it to boil. Serve hot. Tean's gourmet vegetarian curry paste is available at Asian grocers. Or get it from Amazon. If you’re a meat lover, you may add chicken, fish or pork into it. I tried to make curry fish balls with this curry paste with satisfied results. I used store-bought vegetable stock. For convenience, you might like to replace it with water. This is something I can eat daily! 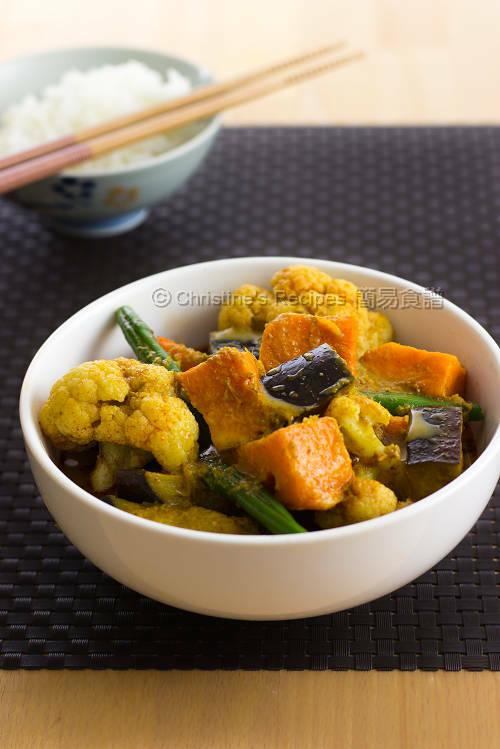 Your veggie curry looks healthy, delicious and packed full of flavours, Christine.